Arriving at the Kutupalong makeshift refugee camp complex in Bangladesh, the first thing one is struck by is its sheer size. Home to close to 650,000 members of Myanmar’s Rohingya community, its population is comparable to Frankfurt or Memphis. But unlike in those cities, people here have little access to clean water, health facilities or proper accommodation. Also, the more vulnerable refugees — including the elderly, mothers and young children — often have a hard time reaching food distribution points. And when they do, they must wait several hours to reach the front of the line. 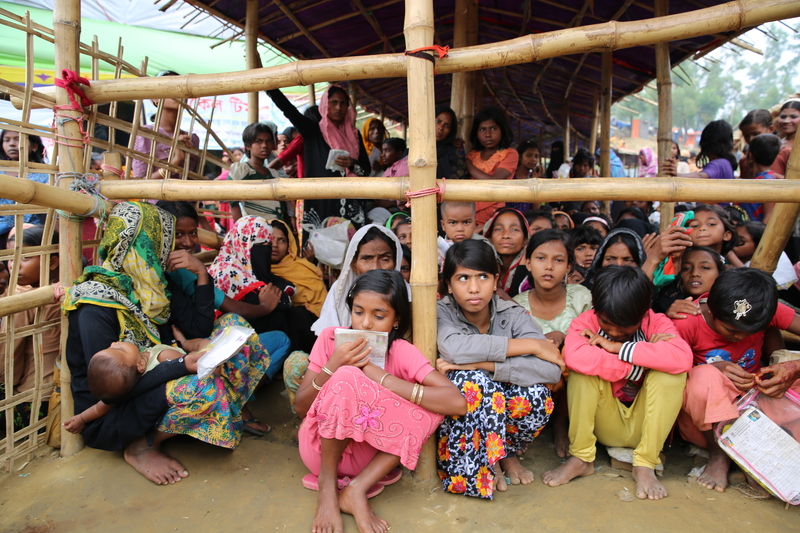 Rohingya refugees in Bangladesh wait for food at a distribution point. After surviving decades of persecution and, more recently, horrific massacres at home, here the Rohingya face a shocking reality: that even if they are safe in Bangladesh, for now at least, their lives are still a long way away from getting any easier. It almost beggars belief that a camp this size was only set up just over three months ago. 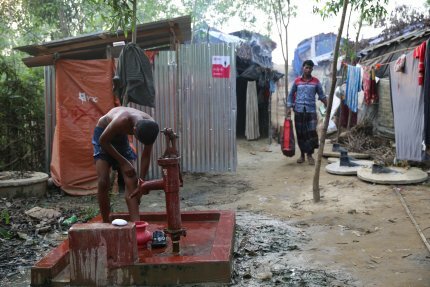 The people who live here now fled to Bangladesh following the August 25 killings in Myanmar, which saw men, women and even children brutally slaughtered in a wave of violence blamed by refugees on the army, the police and armed militias. In Kutupalong, many Rohingya are still shocked after what they lived through, and the mood is stark. Women who lost husbands find it hard to smile, and to muster up the strength to care for their babies. Men whose wives were raped and murdered say they have no hope left in the world. All around the camp are scenes of misery and filth. Children as young as one or two play in ditches of mud melted with human faeces and urine. There are latrines and people use them, but despite the efforts of the community and NGOs to develop emergency infrastructure, water and sanitation facilities are currently a potential source of health problems. 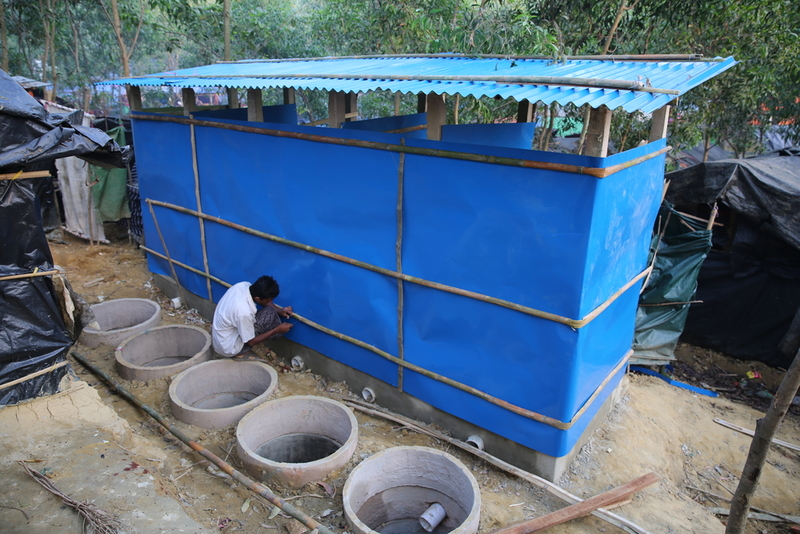 Several latrine pits are only a metre deep, and no system has been put in place yet to drain or pump them clean. As a result, some are simply closed when they fill up, and the waste inevitably drains out through the cracks in the cement lining, and into the ground, representing a major health risk. Lantrine waste inevitably drains out through the cracks in the cement lining. 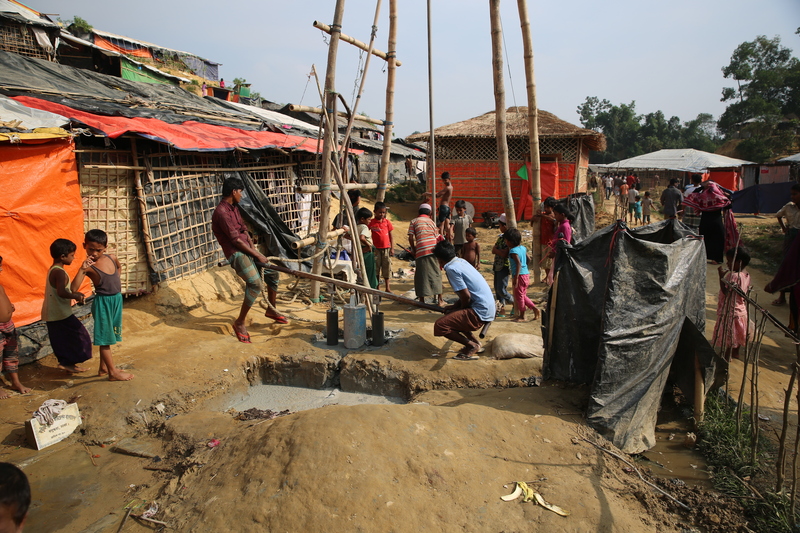 Just one or two metres away from the latrines, people pump water from shallow wells, which they use to drink and wash. The wells were installed to help cope with massive influxes of people. But they appear to only have been drilled between 10 and 20 metres below ground level. 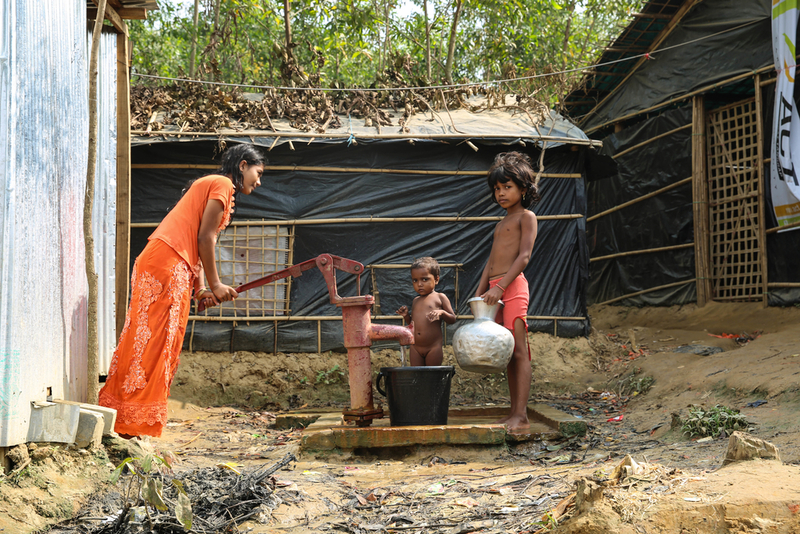 Latrines and water hand pumps are on the same level, which is a cause of contamination. As such the water is likely to be contaminated. 58% of water samples collected from households and wells are highly or very highly contaminated by faecal matter according to the World Health Organization’s data published in its weekly bulletin on November 19th. This poses acute problems for everyone here, especially for pregnant women and young children more exposed to the consequences of diarrhoea and risks of hepatitis E.
Secondly, as the dry season approaches, there is a risk that wells will run dry. MSF staff are trying to break the link between boreholes and latrines, by drilling deeper into the soil, in a bid to supply safer water to health facilities and for the people in the camp. But the sheer scale of the deprivation is staggering and it will take a huge effort to make conditions in this camp bearable. 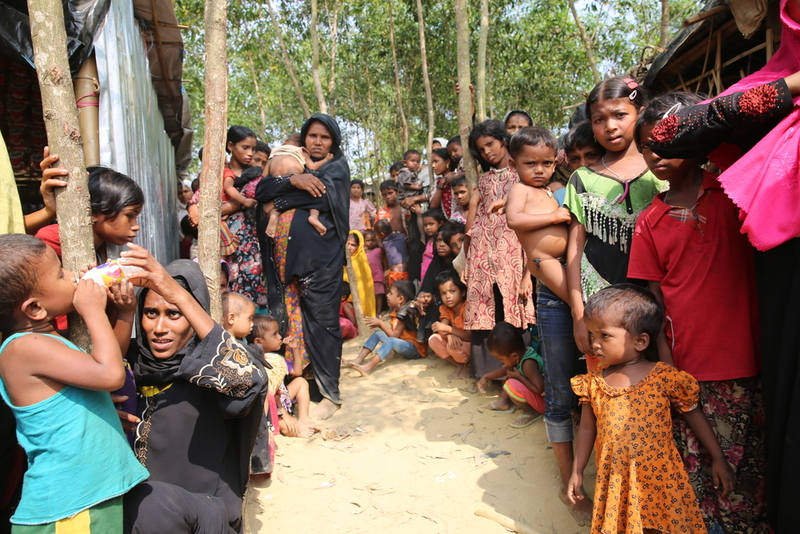 Women and their children wait in line for assistance from UNICEF. Before 25-year-old Al Maskata arrived in the camp in September, she used to breastfeed her seven-month-old daughter Nourshe. “But I have run out of breast milk, and I cannot feed her any longer,” she says. Not only is there little access to formula powder here but as the water may be contaminated it would it be dangerous to use it for mixing milk. Her daughter’s arms and legs are now emaciated and her belly is swollen because of the malnutrition that she suffers. She barely smiles as other young babies would, she has diarrhoea and fever, and she hardly moves. A fellow refugee gave Maskata vegetables to cook for her child, but of course, she is unable to digest them, and so she vomits every time her mother tries to feed her. 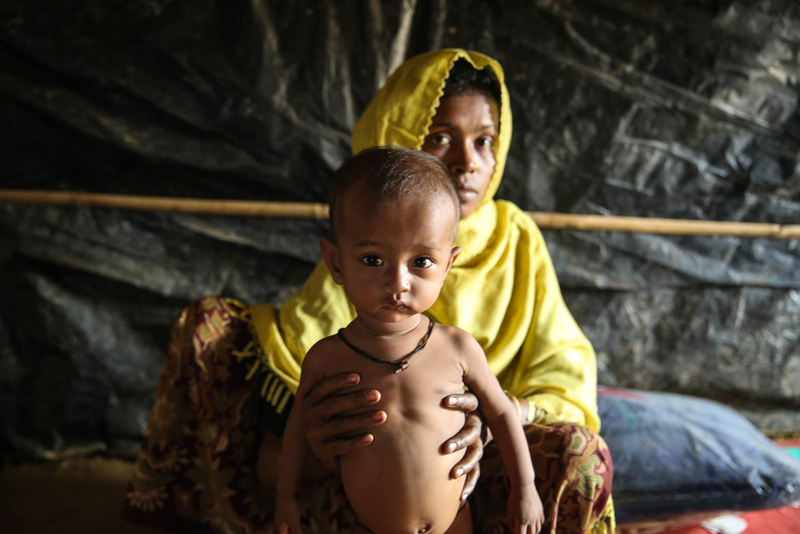 Al Maskata with her seven-month-old malnourished daughter. Back home, she used to breastfeed her but her milk has run out. “The NGOs distribute food (for adults) but I haven’t found milk for my baby. I live up in the hills, and it’s hard to go with my three children to the distribution points,” says Maskata, whose husband was murdered in Myanmar. As an alternative, she tries to feed Nourshe crushed rice boiled in water. But it isn’t enough, and her daughter is constantly hungry. “My children are my main concern. Life wasn’t ideal in Rakhine state (in Myanmar). It was unsafe and unstable. But at least we had a small farm and we had a little money,” Maskata says. In a reflection of the seriousness of the situation of children living in the camp, the majority of MSF patients are under the age of five. The main problems MSF doctors are treating are diarrhoea, respiratory problems and the recent outbreak of diphtheria cases. There has also been a measles outbreak making it the first cause of hospitalisation and mortality. Vaccination coverage is still an issue despite a recent mass campaign. For Dilaforuz, who is close to 100 years old, life is extremely tough. 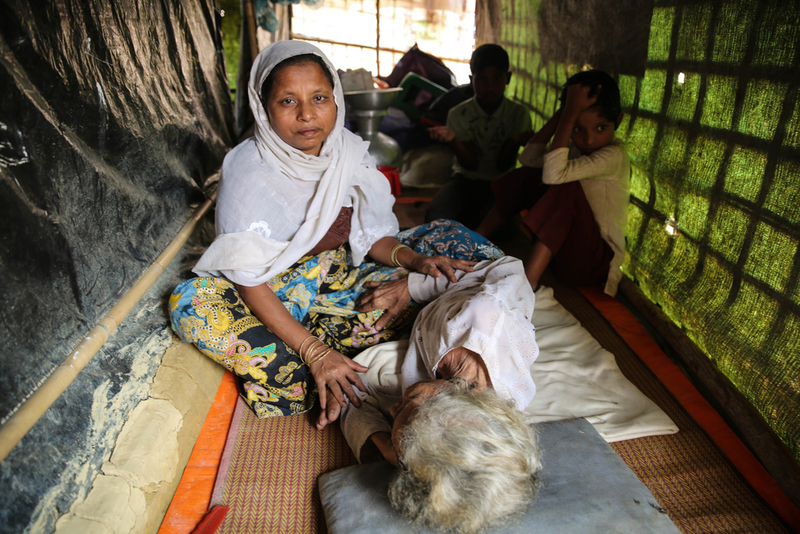 She arrived in the camp with her son Solim — who carried her on his back for eight days from Myanmar to Bangladesh — and her daughter-in-law Jahura, as well as her six grandchildren. Despite her advanced age, her health was in better condition before the family was uprooted from a village named Tom Bazar late this summer. Local doctors frequently visited her at home and provided her with the medicine she needed for her ailments. Dilaforuz, 100, can hardly breathe because of severe asthma and cannot eat any solids. But now, she is dying. She can hardly breathe because of severe asthma. She cannot eat any solids, and she cannot speak for lack of air. But she does cry frequently, her only lifeline is her son and daughter-in-law, who feed her sugary drinks to keep her going. “We are here, living with nothing, but at least we are safe. We don’t have any problems except the fact my mother-in-law is so sick. I hope an NGO can help us and give her medical assistance. It makes us very sad to see her groaning with pain, suffering and coughing day and night,” Jahura says. “It would help if my husband could find a job. But it’s impossible in the camp, and we’re forbidden from going to Cox’s Bazar city to try to find work,” she says, adding that Bangladeshi security checkpoints prohibit the Rohingya from leaving the camp area. For 65-year-old Zulcher, who fled a town named Buthidaung, life in the nearby camp of Balukhali is a daily struggle. She, like hundreds of others, has spent seven hours waiting in line at a food distribution point. Weeping, she remembers her son Aladdin who was buried alive by army troops aged just 25 in Myanmar. Under the scorching sun, she is fighting hard to stay hopeful and to take care of her 20-year-old son Mohammad, who is with her in the camp. She is the one who must stand in the queue because her son is too ill to leave their shelter. Zulcher’s life is filled with sadness, but there is no pain perhaps like Rafik’s, who lost his one-year-old boy Mohammad Ayoub in the camp to pneumonia. Rafik and his family had also fled the town of Buthidaung in late August. 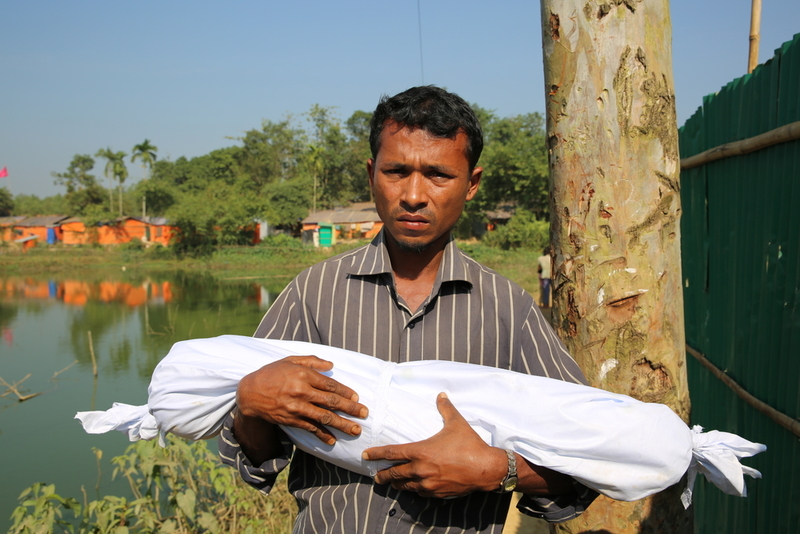 Carrying the body of his dead baby in a white shroud, he was heading to a spot to bury him in. Mohammad Rafik who lost his one-year-old boy Mohammad Ayoub in the camp to pneumonia.